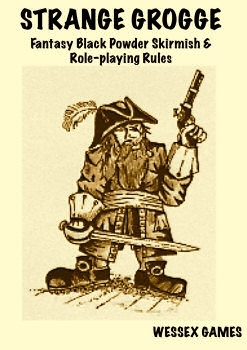 Strange Grogge is a set of black powder fantasy skirmish rules, designed for 28mm scale battles between orcs, dwarves, elves and other popular fantasy races set in the fantasy realm of The Land, centring around the pirate infested region known as The Barbarous Coaste. Includes: Swashbucking melee system and 20 missile weapons Four different types of magic for eight fantasy races Optional role-playing rules to provide even more detail. Pages: 32 A4 including cover. To buy Strange Grogge go here. 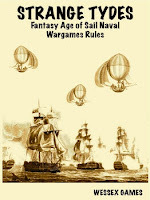 Strange Tydes is a fun and simple game to play of fantasy age of sail naval warfare. Use ships based on historical equivalents of the eighteenth and nineteenth centuries, the way only an Orc or Dark Elf can. Pit the wooden walled men o'war against the erractic ironclads of the Dwarven principalities. Encounter sea monsters and face strange magick on the oceans of The Land. Play the only game we know of where you can kill the opposing vessel's ship's parrot!! All you need to play Strange Tydes is a copy of the rulebook, a selection of models (though cardboard counters can be used), some dice and a flat area on which to play. Includes: Complete tabletop rules for naval battles between the various races of The Land, including Ironclads, Fortifications, Fire Ships and Magick. Full background details including a map of the treacherous region known to all as The Barbarous Coaste. Details of all the races of The Land fighting on the seas of the Barbarous Coaste during the Wars of Dwarven Succession. Naval Lists of the various fleets involved in the Wars of Dwarven Succession with full details of crew and vessel availability. Three introductory scenarios set on the legendary Barbarous Coaste. Pages: 30 A4 including cover. To buy Strange Tydes go here.